In the financial world, the CFA is one of the more respected abbreviations one can have next to their name, more so than MBA according to many. The CFA exam is a grueling three part examination that has a pass rate of only near 50%. That said, if cryptocurrencies, blockchain and similar technology are being included on the exam, they are clearly becoming of significant prominence to the financial world. The CFA Institute, whose grueling three-level program has helped train more than 150,000 financial professionals, is adding topics on cryptocurrencies and blockchain to its Level I and II curriculums for the first time next year. Material for the 2019 exams will be released in August, giving candidates their first opportunity to start logging a recommended 300 hours of study time. 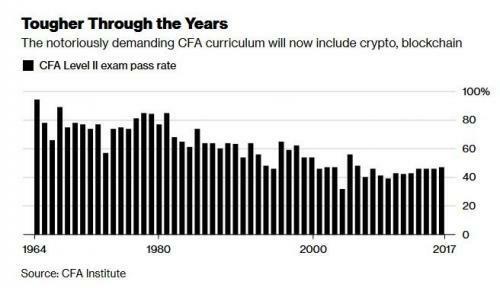 The managing director for general education at the CFA Institute told Bloomberg that he "...saw the field advancing more quickly than other fields and we also saw it as more durable.” He also noted, regarding crypto and blockchain that it “...is not a passing fad." Still, while it seems like blockchain technology will be unavoidably intertwined in numerous industries going forward, the price of Bitcoin has stumbled since the beginning of 2018 as the euphoric bubble of late 2017 remains elusive, alongside interest in the crypto space and trading volumes. The one underlying question for crypto and blockchain over the last couple of years is how legitimate the technology will become to regulators in the overall market. Many investing in both crypto and blockchain technology admittedly are doing so in speculative fashion. And while many believe that blockchain technology will become a financial mainstay for years to come, the use and availability of digital currency still remains up in the air. Adoption of digital currency took off early, as Bitcoin found itself skyrocketing to highs of nearly $20,000 per coin last year. Since then, some of the luster of being a new technology has worn off and the price has since fallen by more than 50%. However, as a silver lining, today's news follows a report that asset management giant Blackrock is creating a team to explore cryptocurrencies which many see as the catalyst that push the price of cryptos higher on Monday morning. So with Blackrock and the CFA Institute on board, will the institutional adoption of crypto finally be getting a much needed tailwind?